Joshua lives and works most of the year in New Orleans. But he does spend some time in Michigan where he began his artistic studies at the Center for Creative Studies in Detroit. He followed that with studies at the University of Nebraska and at various studios in Europe. He augmented his studies with an apprenticeship under Reinhold Marrxhausen. Joshua not only paints but also sculpts the human figure in life-size pieces. A favorite subject is blues and jazz musicians. Living in Detroit and in New Orleans has provided him with alot of exposure to the exciting subject material. 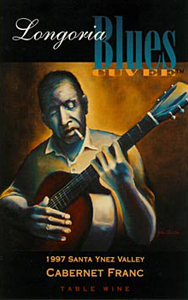 For our Blues Cuvée, Joshua captures a blues guitarist in a somber almost weary mood. Enveloped by dark shadow, the soft light highlights the features of the man’s face and hands. In contrast to the black and blue shadows around the figure the earthy red color of the guitar stands out. This painting was done with oils on canvas.